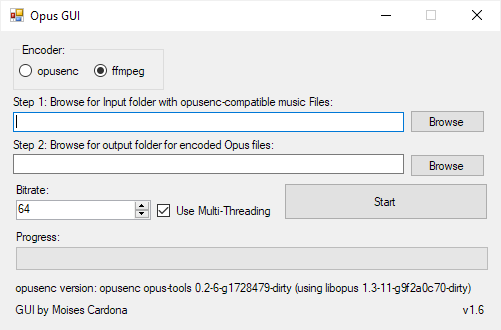 Hi everyone, Today, I have released Opus GUI v1.6: This new version adds support for ffmpeg, allowing you to choose between opusenc and ffmpeg to encode your music files. Download To download this new version, click here. You’ll be redirected to the project’s GitHub page. Please note that the software does not comes with ffmpeg, but you can download it following the instructions found by clicking here Enjoy! 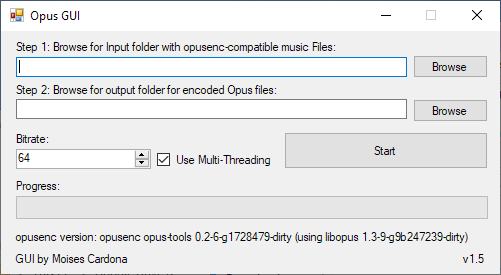 Hi everyone, Today, I’ve released Opus GUI v1.5: This release adds drag-and-drop support to the GUI and also allows you to drag and drop a folder into the software executable. You can download this new release at GitHub here: https://github.com/moisesmcardona/opus_gui/releases/tag/v1.5 Enjoy! Hi everyone, Today, I’ve released v1.6 of rav1e GUI: This new release adds Drag-and-Drop support, which means you can now drag and drop a video file into the GUI or software executable and it will be used as the input automatically. No need to browse for the input video file again! That is, of course, if you use the new drag and drop feature. You can download this new release at GitHub here: https://github.com/moisesmcardona/rav1e_gui/releases/tag/v1.6) Enjoy! Hi everyone, Today, I’ve released v1.4 of Opus GUI: This version is actually a bug fix that the software had for some time with no reports of it, and it was a silly bug. It didn’t allowed you to specify a bitrate higher than 100kbit/s. Now, with that fixed, you can encode files up to 320kbit/s. Yay! You can download this new release at GitHub here: https://github.com/moisesmcardona/opus_gui/releases/tag/v1.4 Enjoy!